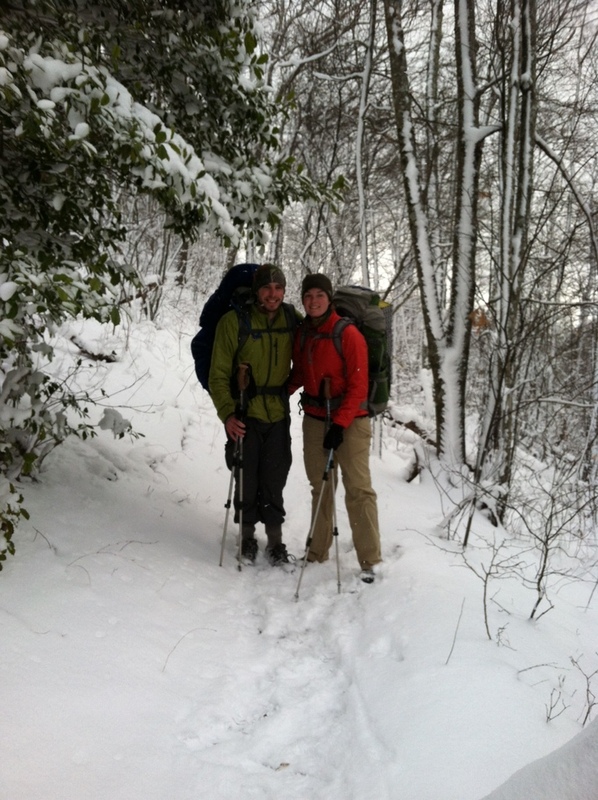 Hiking in the NC snow. What are you both finding will keep you comfortable in the cold for camping? (or that you wish you had to keep you warmer). We are hiking out in February next year since we are going through to Canada and are preparing for winter conditions. But figured you may have suggestions now from your personal experience. We both have 20 degree down bags and I have a liner that adds 15 degrees of warmth. Both work really well for me. And when it gets down to the teens or 20s at night, I sleep with my coat and hat on too. There was one really cold night, but we’ve never felt cold at night with our bag and liner. Great! That’s awesome to hear. We both have 15 degree bags and got 15 degree and 20 degree (20 for me since I’m a cold sleeper) liners. It sounds like you both have encountered what is more typical for february weather, so that’s reassuring. Thanks for replying. We both appreciate it. Is it hard to see the white blaze markings in the snow? Nice job with the blog.